The one way – the traditional approach would be to start at the beginning and work meticulously through each passage. It might take a couple of years to get through, but it might be worth it. God can certainly use a book like Isaiah or Chronicles to shape your church. At the same time, people may grow slightly disenchanted after a while. So perhaps you’ve avoided these longer books? 1. Whole Book, Varied Text Length – Just as the label suggests, you can still preach the whole book, but don’t always preach the same length textual units. To cover a few verses one week and a few chapters another week can add energy and momentum to a series. 2. Whole Book, Highlight Texts – Again, my labels are giving the game away here, but you can also preach the whole book by offering sample highlights from each section. Carefully done this can motivate people to read the whole for themselves, which is never a bad by-product of your preaching. 3. Section of Book – God did give us 66 whole books, but I think it is allowed to take a key section and preach it methodically. Some sections of books are bigger in size and richer in content than other entire books, so why not? Just remember to keep the section in its larger context as you study and preach. 4. 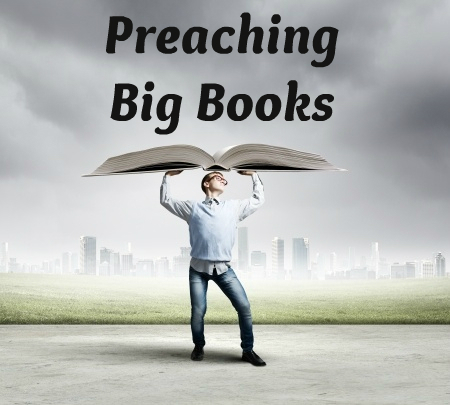 Whole Book in One, Plus Whatever – To start or finish the series, why not preach the book as a whole in some way? By doing this you give the benefit of the big picture, and also have the freedom to not cover every detail in the rest of the series. 5. Section Overview, then Highlights – Another approach is to give a big picture of a section, followed by a highlight passage in that section. Then the next two weeks do the next section. For instance, you could preach an overview of Isaiah 1-12, followed by a week in Isaiah 6 alone. Then overview Isaiah 13-27, followed by Isaiah 25 alone. Etc. Hello, Peter. I’m currently preaching a series I’ve titled “Quotable Isaiah”, which I guess is your option #2. I’m picking famous, oft-quoted, eloquent verses and preaching on each in the context of the book as a whole. I just preached on 42:7 (but really, it was on 42:1-9). I’ve given very brief section overviews as the sermon introduction, with especial reference to passages in the section that I covered in a previous sermon. I think it has worked well. Thanks Jon, that is not dissimilar to our current series, “The Jesus Trailers” looking at messianic prophecies in Isaiah.